From 1976 to 1983, the Argentinean junta terrorized the opposition, especially targeting leftist activists, who were kidnapped by the police and disappeared without a trace; the 30,000 victims of “forced disappearances” were known as desaparecidos. Jorge Julio Lopez was a bricklayer from Buenos Aires who disappeared, and from 1976 to 1979 he was tortured and transferred from one prison to another numerous times. Three years after the fall of the junta, the controversial “Full-stop Law” – Ley de Punto Final – was enacted, insuring the impunity of the police and military except in cases that qualify as crimes against humanity. Jorge Julio Lopez was one of the key witnesses to testify in a trial against sixty-two generals and police officials. On September 18, 2006, just before submitting his final testimony, Lopez disappeared again – to this day, he has not been found. Since 2006, the Argentinean artist Hugo Vidal (born 1956, lives and works in Buenos Aires) has sought to maintain the memory of the double disappearance of Jorge Julio Lopez through actions and interventions outside of museum and gallery spaces (see: 1:1 scale). He produces calling cards, calendars, and graffiti with Lopez’s name and the dates of his disappearance. 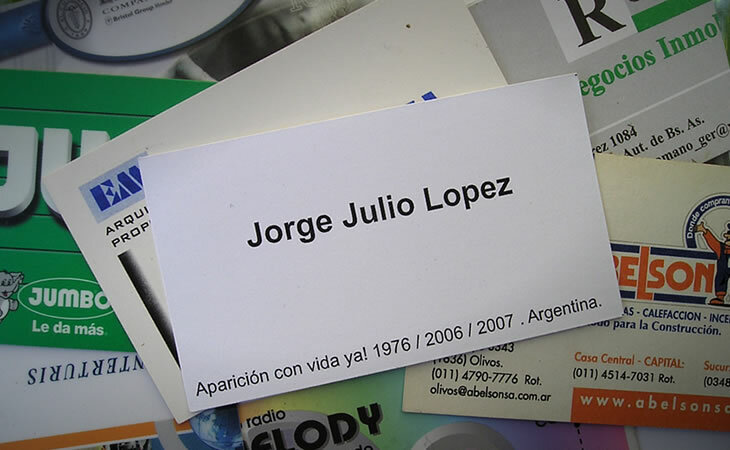 Vidal also conducts actions in grocery stores, surreptitiously stamping labels of the Lopez brand of wine (vintage 2006) with the legend “Aparición con vida de Julio” (“Julio, show up alive”). The report presented in exhibition consists of a bottle and a selection of business cards loaned to the Museum of Modern Art in Warsaw for the duration of the exhibition. Courtesy Hugo Vidal.